How - Advice for Budding Cartoonists — GoRaina! I get letters and emails from a LOT of aspiring writers, artists, and cartoonists, asking for tips and advice. Without knowing each of you personally, it’s hard to be too specific, but I do have some general advice for budding creators that I can share! Sounds obvious, but it bears mentioning: The best way to learn how to write is to read. The best way to learn how to write and draw comics, is to read comics. (Or manga, or graphic novels, or whatever you want to call them.) Study your favorite books. Read them out loud. Look up any words you’re unfamiliar with. What appeals to you? Why? Read outside of your favorite genres—you might discover some new favorites! Practice drawing all the time. Take classes. Keep a sketchbook. Draw from life as often as you can. Draw things you’re not comfortable drawing. You’ll only improve. 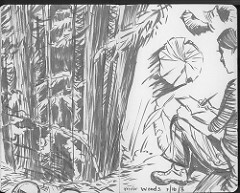 Sketchbook pages from a visit to Muir Woods in Northern California. For years, I was too shy to show anyone my comics. But, once you start to share, people can enjoy them, give you feedback, and help you improve. You might even meet people who share your interests, and now you’ve got a support system! Don’t wait to start sharing your work! Not everyone is the best artist. Not everyone is the best writer. But maybe you can do one and your friend can do another. Team up to create something! Young cartoonist collaborators in Portland, Oregon. 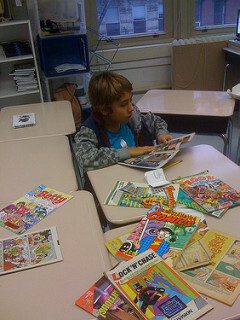 Often, young cartoonists have ideas for long, multi-volume, epic series. They are planning out the story arcs and worldbuilding and drawing hundreds of pictures of character costumes. Why not try creating a short story using these characters and this world, instead? It’s a better and faster way to get to know them. Creating short stories (1 page, 3 pages, 10 pages…) is a great way to improve your craft. From a silent 3-page story called Small Steps. Also known as: make mini-comics! Xerox your pages, fold and staple them into booklets, and share or sell them with your friends. You can absolutely call yourself a self-published author, because you make mini-comics! Here’s a link to a mini-comic making tutorial. My mini-comic series, Take-Out. Each was 12 pages long, black and white. I handmade and sold/distributed about 7,000 copies, total, of my minis! Tumblr, Facebook, Instagram, DeviantArt…pick a social networking platform, and start sharing your work online. Don’t worry too much about things like copyright. If you can give yourself some sort of schedule (one page per week; two comics per month; whatever seems comfortable), you’ll build an audience and build up a body of work before you know it. Do it ‘cause you love it. If you want to make comics or any kind of art…don’t let anyone stop you!